The second annual Mystic Blues Festival, held June 27 – 29 at Mystic Shipyard in Mystic, CT, showcased an array of Blues legends including Grammy winners, Rock and Roll Hall of Fame inductees, and Blues Artist of the Year award winners. With perfect weather and a gorgeous venue, highlights included smokin’ performances by Eight to the Bar, Bad News Barnes & The Brethren of Blues Band, The Alexis P. Suter Band, and the Greg Sherrod Blues Band. An amazing Student Spotlight featured Nolan Leite, Jacob Graham, Zeb Mrowka, and Jessica Oddi – these young musicians are the future of the Blues. On a sad note, iconic guitarist Johnny Winter gave one of his final performances at the festival. Winter, one of Rolling Stone’s 100 Greatest Guitar Players of All Time, passed away July 16. This year’s festival debuted a dedication to Blues education, with music, dancing and drumming workshops throughout the weekend for all ages and abilities. Another attraction was The Art Miles Mural Project, a San Diego, CA-based visual documentation of modern history, portraying the sentiments of more than a half million people from over 100 countries. Attendees and performers were able to be creative on canvas and learn about healing through art. Throughout the weekend, Center For Hospice Care staff and volunteers were on-site to reinforce their philosophy of living as fully as possible, and educating attendees about their Expressive Arts program. The festival is proud to partner with this amazing organization to raise awareness and funds. In only its second year, the Mystic Blues Festival has become a much-talked-about event. Planning is already underway to bring more fabulous Blues to Mystic in 2015. 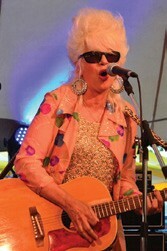 Visit mysticbluesfestival.com for information and to view a photo gallery from this year’s festival.